Brigg Town Community Interest Club’s hopes of a remarkable quadruple came to an end on Saturday when they were beaten by the semi-finals of the Supplementary Cup. 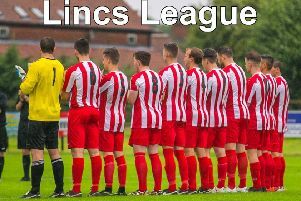 Hosting Lincolnshire title rivals Lincoln Moorlands Railway ion front of a good crowd of 128, Sean Cann struck after 28 minutes to give the visitors a half-time lead. The tie appeared to be heading for extra time when second-half substitute Reece Moody levelled for Brigg with 16 minutes remaining. And five minutes later the odds appeared to have turned fully in favour of the home side when Moorlands were reduced to 10 men after Jake Stokes picked up his second yellow card in the space of six minutes to be sent off. But Moorlands had the final say in the fourth minute of stoppage-time when Robert Smith popped up to claim the winner. Moorlands will go on to play Wyberton in the final. In the league, meanwhile, Gainsborough Trinity Reserves returned to the summit after chalking up a 2-1 win over Nettleham. Brigg sit third, three points behind the leaders with two games in hand, and a point behind Moorlands having played a game more. Brigg are again in knockout action on Saturday when they head to bottom side Louth Town’s Saltfleetby ground in the semi-finals of the Challenge Cup (kick-off 2.30pm).